I was walking through the office with Lenovo’s ThinkPad X1 Carbon dangling between two fingers when my colleague spied the logo. “That was my first computer,” she said with immeasurable fondness. The ThinkPad was a lot of people’s first computer. Early ThinkPads were built like a tank and ran smooth like a spinning top. These days, the brand, which IBM sold to Lenovo a decade ago, doesn’t have quite its 90s cachet, but its continues to be a workhorse—and the new fifth generation of its stellar Carbon line is a slick refinement of everything you’ve ever loved about that chunky black machine. 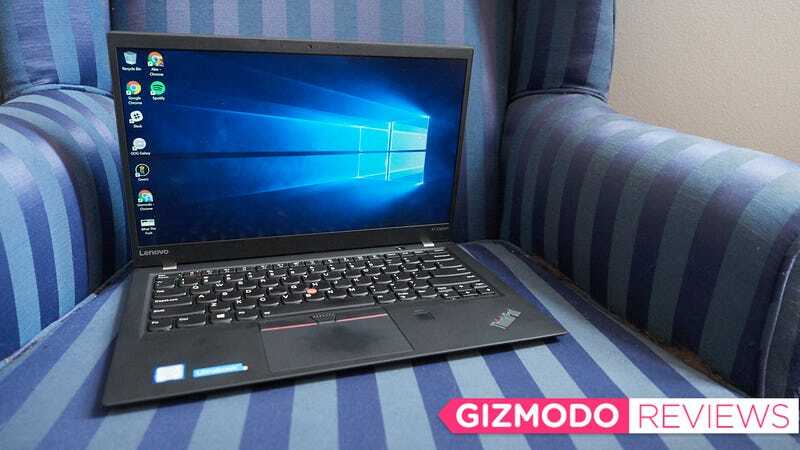 A laptop built for people who actually use them every day. It's light, waterproof, and fast. Built-in software can break the trackpad. Disable immediately. If you’re intimately familiar with each iteration of the Carbon you’ll notice the new device is trim by comparison. While the new X1 Carbon isn’t much thinner than last year’s model, Lenovo’s shaved six inches off the footprint in both directions, while maintaining a big 14-inch display. It’s 1.76 ounces lighter, and has 57 Watt per hour battery versus the 52WHr battery found in last year’s model. So this thing is more nimble and lighter, but just as powerful. And as expensive. The ThinkPad X1 Carbon has never been a cheap machine, and this year’s model is no different: It starts at $1329 with an i5 Kaby Lake processor, and I reviewed the $2200 i7 variation. That’s unusually high for a Windows-based laptop. These days, we largely see Windows as an affordable alternative to Apple’s pricey objects of beauty. But the ThinkPad X1 Carbon feels luxurious enough to warrant the price, and crucially, it’s luxurious in all the ways an Apple laptop is not. It’s thicker than the new 13-inch MacBook Pro. It’s also much lighter and has more ports. Apple has set the bar for premium laptops since Jony Ive’s soothing British accent started popping up in product announcement videos. Currently, if you want to spend a lot on a laptop you can usually expect everything to be aluminum and sleek, with a gorgeous and glossy display. But the ThinkPad X1 Carbon is festooned in soft touch black plastic, the display is matte, and the device is not striving to be the thinnest laptop around, just the nicest. It’s a refreshing reminder that a premium device doesn’t have to look like it was designed in Cupertino. But if there’s one particular aspect of the ThinkPad X1 Carbon that flies in the face of premium designs, it’s that thickness. The chunkiness means it can fit in a nice speedy Kaby Lake processor and up to a 1TB solid state drive, without getting so scorching hot you need to pull it away from your legs. There’s a big unsightly vent on the side to keep things cool, and normally I’d want to cry over that ugliness, but I have to admit that with summer on the horizon, a laptop that stays cool even when I’m running a game is an appealing proposition. The thickness also affords the laptop plenty of space for ports so you’re not a prisoner of dongles as you need to be with more minimal USB-C only laptops. It includes two USB-A ports, two USB-C ports (both can charge the laptop), and an HDMI port. All those ports and the big vent demand the X1 Carbon be thick. But despite its girth, the X1 Carbon is also extraordinarily light. It’s a 14-inch laptop that only weighs 2.49 pounds! The only laptop that balances weight and screen size as neatly is the similarly priced 2.1 pound LG Gram. Yet the ThinkPad X1 Carbon also feels sturdy in a way ultralight laptops never do. Part of that sturdiness is psychological. It’s got a really good balance to it, even when laid out flat like a frisbee, and soft touch plastic just naturally makes things feel more durable than they might be. Yet this thing is also constructed with durability in mind. There’s no glass to shatter or metal to chip. If this laptop accidentally fell on the floor my heart wouldn’t jump into my throat. Nice large keyboard, but a couple of keys are placed in irritating places. And if I spilled a little water on the keyboard I wouldn’t freak out. The keyboard’s spillproof. It’s also really really nice to type on. Each key has over 3mm of travel, which is a lot for a laptop keyboard, and there’s a slight curve to every key so that your fingers fall just right. The keys don’t click with a snap, but they’re firm and wonderful for churning out long emails. The function keys are also larger than what you usually find on a laptop, and Lenovo has managed to squeeze on keys usually only reserved for giant 17-inch laptops. Keys like Home, Insert, and Delete. Page Up and Page Down are also on the keyboard, but they’re set next to the arrow keys, which led to quite a few accidental mistypes while I was testing the laptop. It handles moisture pretty well! In another plus that not every premium computer can claim, the laptop’s battery life is good enough that I don’t have to worry about charging it constantly. The ThinkPad X1 Carbon charges via USB-C, which made it easy to leave the charger at work and use my own USB-C charger at home. Yet I only had to reach for the charger twice over the weekend, and that’s after using it for a whole day of watching Netflix. On average, I got about ten hours of use on a charge, while doing the normal mix of internet work, emails, Photoshop, and some light gameplay. The battery efficiency actually surprised me a little, because the screen on this thing is huge. A big chunk of your battery life goes to powering big screens like the 14-inch display on this laptop. Taking a page from Dell (and Samsung), Lenovo’s shaved away nearly all the bezel around the display in an effort to cram a 14-inch one into a much smaller laptop. It’s stunning at first glance, but after a while it’s frustrating that it’s 1080p only. If there’s a place Lenovo missed the premium ball, it’s on that display. NUBBIN. Also keys with fantastic travel. The only other real notable “issue” with the ThinkPad X1 Carbon is its mouse solution. There’s a trackpad in the usual place and a dorky red pointing stick at the center of the keyboard. Lenovo insists it maintains the pointing stick because the ThinkPad’s fans love it. Good for those fans, but it’s a questionable decision all the same as presumably those fans are retirement age and can’t have that many laptop purchases in their future. Pointing sticks are a product of a bygone era. They were, once upon a time, super common on laptops. Most trackpads were terrible, and the nubbin, while not especially nimble, was at least consistent. I was forcibly reminded of that history lesson due to the ThinkPad X1 Carbon having a weird trackpad setting enabled. I originally thought something was wrong with the laptop, as the trackpad seemed to randomly die, forcing me to use the nubbin instead. After Lenovo sent a second unit with the same issue I started poking around the firmware and software for the trackpad, hoping it was a software issue. It was. Drilling deep into the Synaptics firmware for the trackpad I found “Edge Tap Filtering” enabled. The setting is built for people still stuck in a time when touchpads included buttons. It’s meant to make dead zones. I’m not sure why the elderly love this setting, but I can confirm that when it’s enabled you will want to murder your laptop by flinging it into the sun. Once that issue was resolved, I had zero use for the pointing stick . Because pointing sticks are no longer a “thing.” Lenovo’s bright red one feels a little outdated. It makes an otherwise cool new laptop look like something out of 1998. In a world of flimsy, shiny laptops the ThinkPad X1 Carbon sets itself apart with its 90s look. Retro isn’t necessarily in, but its also not the end of the world. The ThinkPad X1 Carbon is so well built that I don’t mind it’s fashion faux pas. If you’re a typist with cash to burn, or you need a big display and a lot of power in a package that’s super light, then the ThinkPad X1 Carbon should be one of your top choices for a laptop. Trackpad had some system breaking software enabled out of the box. That’s bad. The pointing stick still works. Cool? Soft touch plastic makes this thing feel great, but boy does it attract fingerprints. Correction: This post originally referred to Lenovo’s TrackPoint branded pointing stick as a trackball. It has been updated to it’s proper term: pointing stick.